The medium of digital marketing is fast rising and becoming popular, lots of entrepreneurs take it to the internet now, using this to market their products which is why standing out from this crowd is very important and a key element to boost your marketing online. This is for yourself and primarily for your clients who can easily recommend your agency or products to their friends, colleagues or loved ones and thus creating an avenue for new clients. Standing out is all about making your marketing online or your digital marketing agency unique, different and of course original and distinguishable from the other digital marketers out there, more like having your own trademark. How then, do you stand out and what are the key things to take into consideration. Since it is all about the clients, then the first thing to take into consideration would be your target audience. Your target audience could be female, infants, or men, the way I see it, everyone is your target audience because you could market male underwear, and have in mind your target audience be the male, however, I could take interest into what my brother or boyfriend would like or what I think suitable and could be interested in your product or not as a female. So first of all, take everyone to be your target audience before considering the specific audience whom the product is for. Your audience would determine your approach, style and content of your marketing as they are the ones whose attention you are trying to gain. Next, it is smart to know your competitors, so you can be one step ahead of them. This should be a healthy competition, not one to involve fraud, defamation and the likes, else you will get sued. Instead, be involved in the game, if they seem to be getting the customers satisfied, I believe you would want that too, understand their approach and be creative about your next plan of action. In addition, your products should be considered too when trying to stand out of the crowd as it determines how to approach your audience and present the adverts. 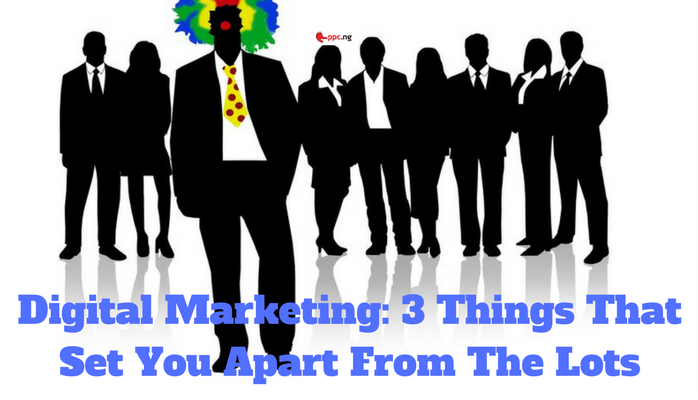 Here are 3 ways I believe you can stand out as a digital marketer after putting those three things into consideration. 1. Giving your content a boost: your content could be in different forms, a video, a dialogue, pictures, presentation of known facts, a speech, and it could even be interactive i.e. between you and your clients like having quizzes, polls, conducting surveys and making live videos. Through this you can easily interact with your customers and what better way to get them involved right? Your content is the most important part of your marketing as it connects the viewers to you and an interesting and captivating content gets you more clients. Understanding the platform by which your content would be delivered and shared to the world is key as it would help in knowing how to use the tools to your advantage, and know what the audience on that platform like, and don’t like. Social media is just about the widely used and most popular platform by which you can deliver your content to the world. Your area of concentration should remain what makes your product special and how the people would benefit from it, your content should be original, not too exaggerated and not too underrated. 2. Working on that sales pitch: sales pitch is that effort you make to sell or promote your products, that extra step every entrepreneur takes to impress the clients, and this can also be achieved via digital marketing. Here, the people cannot see you, or they rarely do, they see your product, they see how you relate with response to their comments, they see how fast your online services are, they would like to express themselves easily via the comment section and get attended to, they would love to be appreciated on their birthdays, special holidays, have a catchy slogan, let them feel like you are not just another random marketer wanting to sell his product, but like you understand what is going on, the reason the product is available for them, the list goes on and on, and this pitch is what you use to draw these clients and increase their commitment to your brand, flexibility is also key here. 3. Complement your marketing: while digital marketing is good, convenient and fast, limiting your marketing to the digital world can be an impediment on your way to standing out. Complement your digital marketing with good old fashioned marketing. The kind that existed before computers and the internet became available for such purposes. The thing is there are lots of product to be seen online so there is every possibility that yours would be skipped by users on various platforms due to various reasons. The old fashioned marketing is just to serve as a backup and avenue to reach every possible client, including those that are not online. So, don’t drop the prints, tv, radio and event adverts yet, let your clients see more of you. In addition to these points, your pricing can also give you a headway, you don’t have to be cheap, just offer discounts when you can, throw in a buy one get one free, post your prices for relative comparison, and give a strong reliable data about your products, what you do, after sales service, etc. make all these things readily and easily accessible to your clients.